You are trying to buy the 16GB Google Nexus 4 unlocked, so naturally you tried the Google Play Store first, but the phone was out of stock there. The Play Store recommended that you check out T-Mobile's online site, and even provided a link for you to click on. But you quickly found out that the phone was sold out at T-Mobile as well. Where can you go? What can you do? 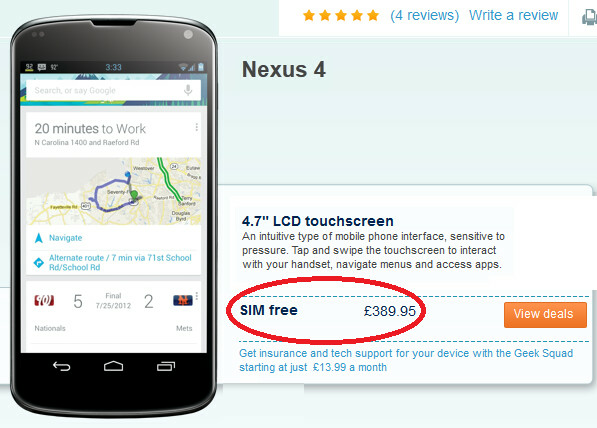 There is actually some hope for those who don't mind paying up for the 16GB Google Nexus 4, as the U.K.'s Carphone Warehouse has the handset in stock, and SIM-free. Carphone Warehouse is offering the sizzling hot stock Android smartphone online (check the sourcelink) for a price of £389.95 ($621.11 USD) which is £110 ($175.21 USD) more than the price at the Google Play Store for the same exact phone. As we pointed out when discussing the possibility of buying the phone at a T-Mobile location that has stock, and paying $150 more than the price at the Google Play Store, you will have to decide how badly you want the device now. 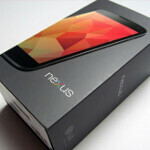 Eventually, the Google Nexus 4 will be back in stock at the Google Play Store, but the question is, when? It is a classic case of supply and demand and right now Carphone Warehouse has the supply. Another place where you can actually grab the 16GB model of the Google Nexus 4 is eBay where a seller is offering the phone at a "Buy It Now" price of $649.99. The seller has a 100% positive feedback rating and has sold 19 units so far. At that price, you are paying $300 more than what the Google Play Store is charging for the model. Heck, you could buy a subsidized Samsung GALAXY Note II for the difference. I'd rather wait a couple of weeks for it to be back on Play Store than pay 50% more hastily. It doesn't matter whether you get the device sooner or later as long as it is the same thing sold everywhere. Its 85% more BTW. Just pointing out the poor math skills. 50% more would only be $525. You would have to be an idiot to pay that. Well here in Pakistan it is available for about $480 but I'd probably end up buying S3 for that kind of money, though I hate Samsung's TouchWiz user interface as I think Vanilla Android is the sexiest interface ever. I think it's Google's fault for not releasing this phone properly and drying up the supply. They are letting the consumers being blackmailed by the likes of T mobile. Google probably end up making the phone of the year and totally messed up the launch. It is a failure of Google play. Especialy choosing LG as the next nexus phone manufacturer. The stock was finished when it was launched. And it haven't got back yet.